"I've been preparing this dressing for family and friends for many years; it's always a favorite! Serves 5 as an entree with grilled chicken, beef, or shrimp." Blend vegetable oil, Parmesan cheese, egg substitute, Dijon mustard, garlic, anchovy paste, Worcestershire sauce, and pepper in a blender or food processor until smooth; season with salt. Drizzle dressing over lettuce in a large mixing bowl; toss to coat. 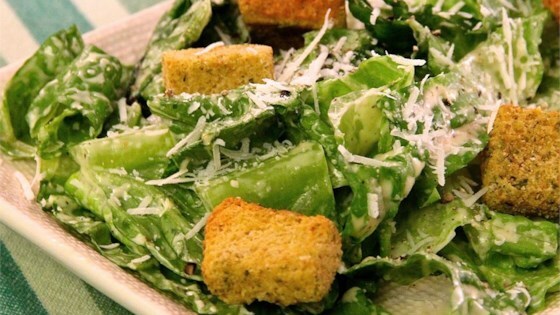 Top salad with croutons. Followed the recipe exactly but added a tablespoon of lemon juice and and 2 eggs instead of egg beaters.It was fantastic!!! !